Most physical access security systems in use today are based upon tokens such as magnetic cards, identification numbers, and proximity cards. Because of their inability to detect false acceptance, they are sources of frequent security breaches. People can enter these systems with someone else's token. Now you can eliminate this type of security problem with the MORPHOACCESS. 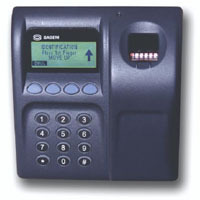 Developed and produced by SAGEM, world leader in fingerprint identification systems, the MORPHOACCESS. is a fingerprint access device that enhances the security systems of physical access control. When configured as an authentication device, the MORPHOACCESS. is a plug & play solution that can be used in new, existing and legacy systems. All components necessary for the access control and fingerprint capture are integrated into the MORPHOACCESS.. It offers a fingerprint storage capacity of 2 templates per person for up to 48,000 persons. The terminal performs one-to-one (1:1) authentication and one-to-many (1:N) identification functions (N limited to 3,000). The terminal is provided with data network interfaces, a keypad and a graphic display screen. People using this device are guided through the authentication or identification process with friendly messages (available in various languages). The terminal can also be used standalone to control the access to a given entry. Besides, different applications are proposed to perform the people enrolment and the management of the terminals. Customization of the device is possible according to the customer’s specifications, to allow plug & play integration and installation in an existing system. Additional text can be displayed in almost any language. Software is also available to manage optional features such as proximity readers and transmission or data encryption. MORPHOIMAGING : For the image quality optimization, during acquisition and preprocessing. MORPHOSOFT : For the biometric functions necessary to template extraction (processing of a fingerprint image) and fingerprint verification or identification. Integrated MIFARE contactless card reader*.